Start by strolling around Stellenbosch. The town, founded in 1679, is very compact so it’s easy to discover on foot. There are many beautiful art galleries, shops and interesting museums to visit, especially along Dorp Street and Church Street. Take note of the beautiful Cape Dutch architecture (with their white-washed façades and elegant gables) as you walk around the town. For breakfast or lunch, I can recommend the Schoon De Companje, a lovely bakery/café at the corner of Bird and Church streets. 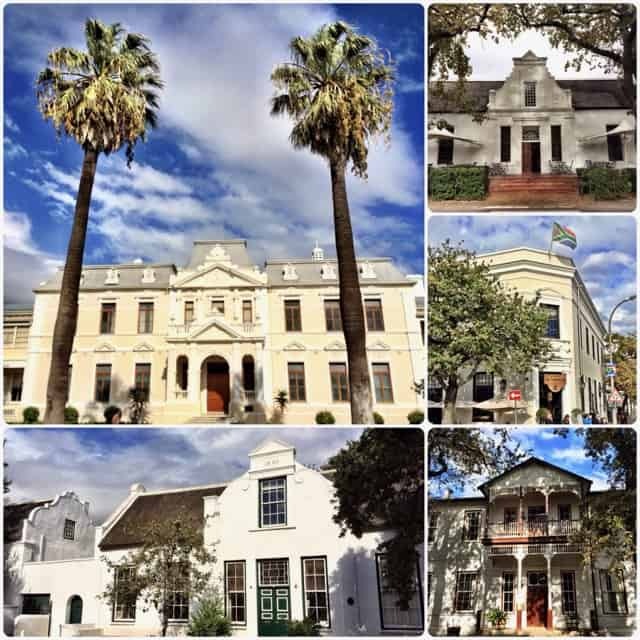 Gorgeous historic buildings in Stellenbosch. Drop by the Stellenbosch Village Museum for a history lesson and check out Oom Samie Se Winkel (‘Uncle Samie’s Shop’), a true Stellenbosch institution. If you’re interested in flora, visit the Botanical Gardens at the university. A typical Cape Dutch house in Stellenbosch. For pre-dinner drinks, head for the Wijnhuis (Andringa St.), Bartinney Wine & Champagne Bar (Bird St.) or Craft Wheat and Hops (Andringa St.). Restaurants in the town centre I can recommend are Coopmanhuijs (this hotel/restaurant is housed in a beautiful 18th century manor and I can definitely recommend a stay/meal there) and Stellenbosch Kitchen (part of the Stellenbosch Hotel). I especially loved dining on the terrace at Coopmanhuijs. 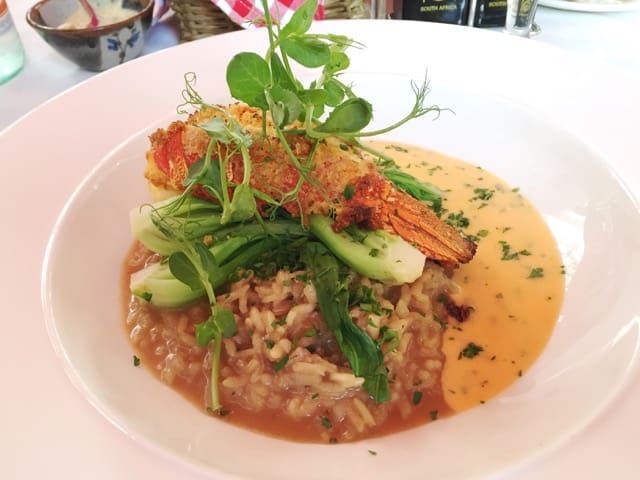 The lobster risotto at Coopmanhuijs. Yum!! 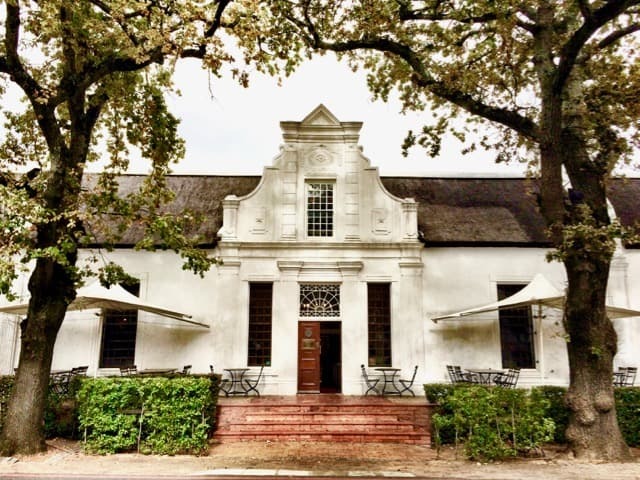 Outside Stellenbosch – incredible wine experiences! If you love chocolates and wines, visit the grand Waterford Estate. Chief winemaker, Kevin Arnold, teams up with chocolatier, Richard von Geusau, to create this unique wine-tasting experience. I highly recommend it. My personal favourite! At the Middelvlei Wine Estate, you can blend your own wine and get a personalised label on the bottle to bring home! While you’re there, enjoy a ‘boere tapas’ (farmers tapas) or grilled specialties by Middelvlei’s braaimaster! Read about my wine-blending experience. 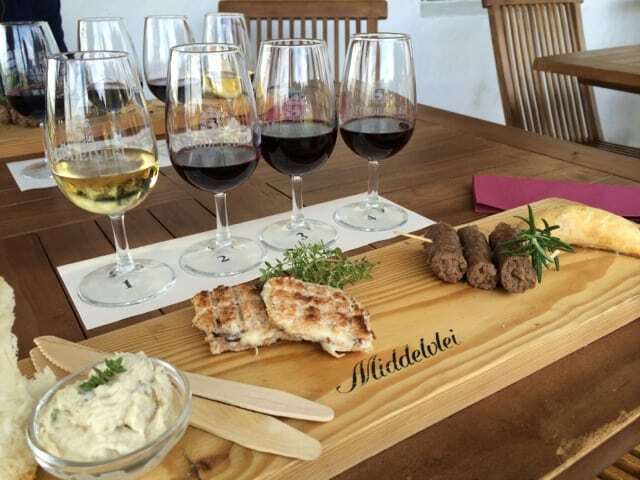 Wine-tasting with boeretapas at Middelvlei. 4. Go on a Big-5 wine safari! The Warwich Estate is situated just outside Stellenbosch at the foot of impressive mountains. Hop on the safari jeep for a drive up into the mountains and a very unique wine-tasting! 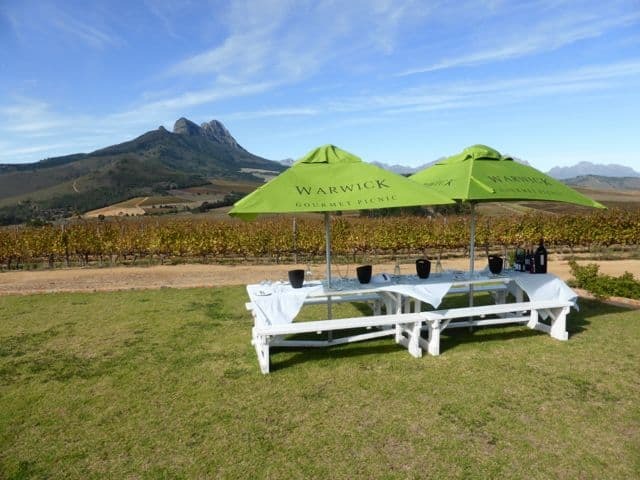 Warwick Wine Estate: a picnic and wine-tasting at a breathtaking spot! 5. Watch the duck parade! The lovely Vergenoegd is home to the increasingly famous duck parade. You’ll have to see it to believe it! Every day at 9:30am and 3:30pm. You have to be sober for this! 😉 Head to the expansive Spier Wine Farm and go on a Segway tour around the vineyards. The scenery is just stunning! While you’re there, check out the gorgeous African art in the main buildings and have a meal at Eight restaurant. 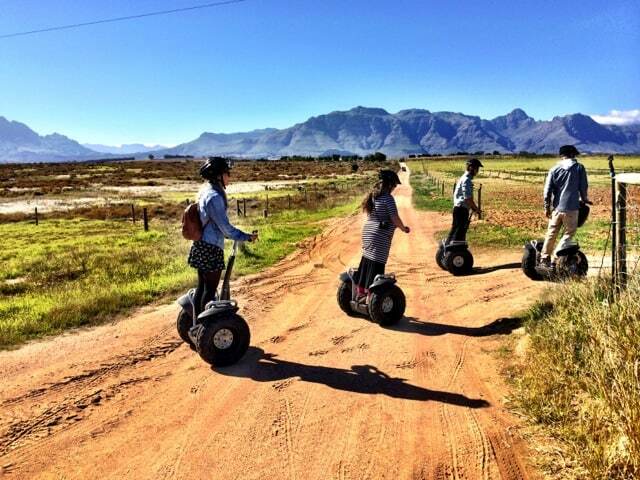 Segway tour through the Spier Wine Farm. 7. Enjoy a glorious sunset followed by an incredible dining experience! The Delaire Graff and Tokara estates are located almost opposite each other on the Helshoogte Pass road. Delaire Graff boasts simply breathtaking views of the mountains (which turn red at sunset!) 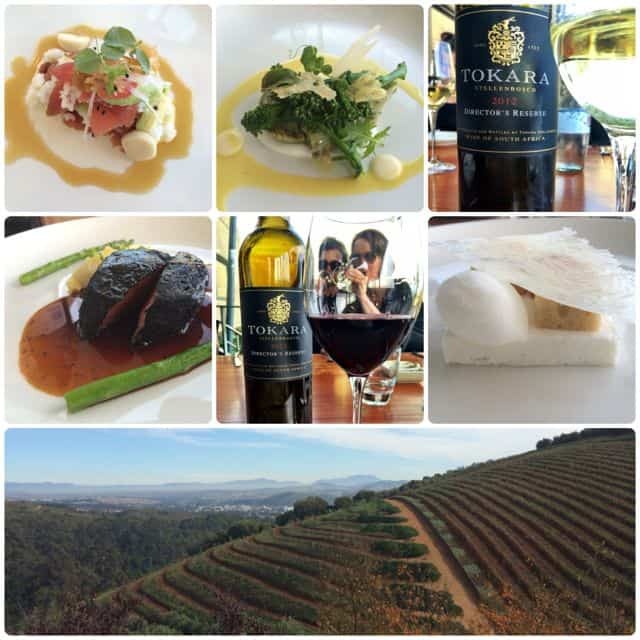 whilst Tokara has sweeping views of the vineyards and Table Mountain in the distance. Both vineyards are home to excellent restaurants, making them both perfect for sunset drinks and an exquisite meal! 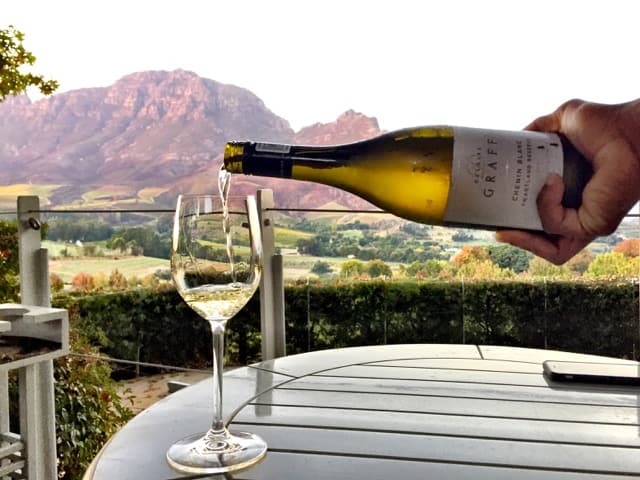 Have a glass of Chenin Blanc at Delaire Graff and enjoy the sunset! Read more about my favourite Stellenbosch wineries. There’s more to Stellenbosch than just wine! The Kayamandi township is located on the outskirts of Stellenbosch. Join a guided tour of the township and meet the locals, listen to their stories of life in the township and learn about (and tuck into) traditional Xhosa cuisine. I highly recommend this tour by Bites and Sites. Kids at the Kayamandi township (image courtesy of Michael Turtle of TimeTravelTurtle.com). The immense Jonkershoek Nature Reserve is part of the UNESCO World Heritage listed Cape Floral region. Go on a leisurely hike to discover the unique flora and enjoy the stunning mountain views. Read more about the Jonkershoek Nature Reserve. 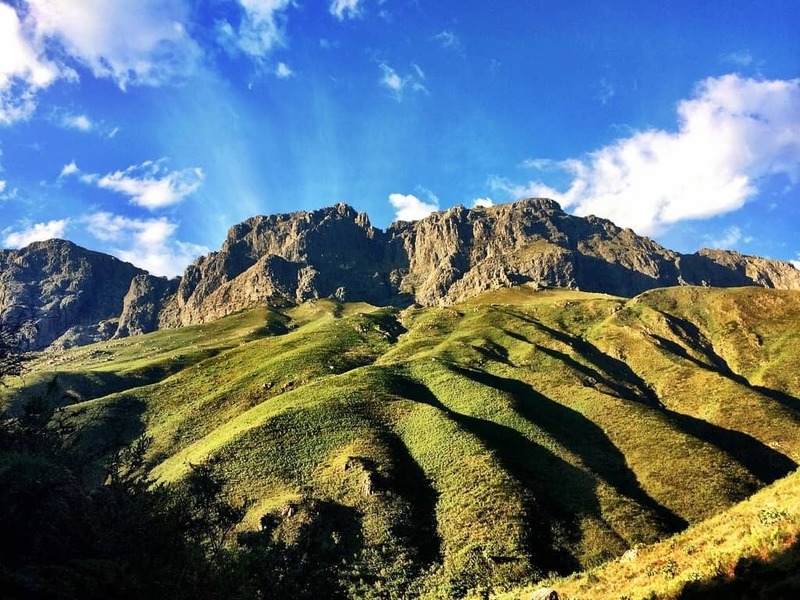 Majestic mountain scenery at Jonkershoek (image courtesy of Matt Long of Landlopers.com). Majeka House is one of my favourite hotels in Stellenbosch. Located outside the city centre, it’s also home to a terrific restaurant AND one of the best spas in the region. Choose from a variety of treatments. Ok, here’s one more tip: explore more of the region! Here’s a suggested route for a road trip around the Cape Winelands. 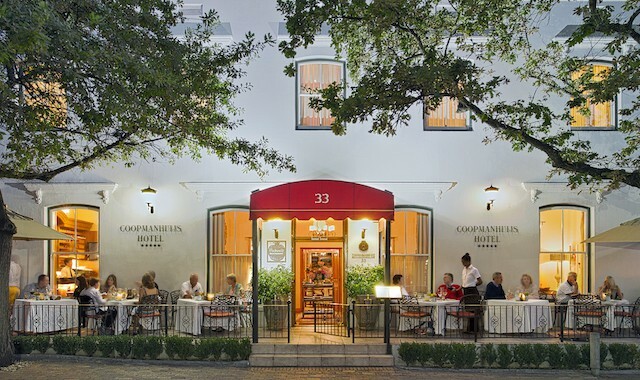 Located in the centre of Stellenbosch town, Coopmanhuijs offers charming accommodations in an 18th century manor and a gorgeous restaurant and terrace. There’s a small lap-pool in the back. Top marks for excellent service and the food! Coopmanhuijs Stellenbosch (image courtesy of Coopmanhuijs). 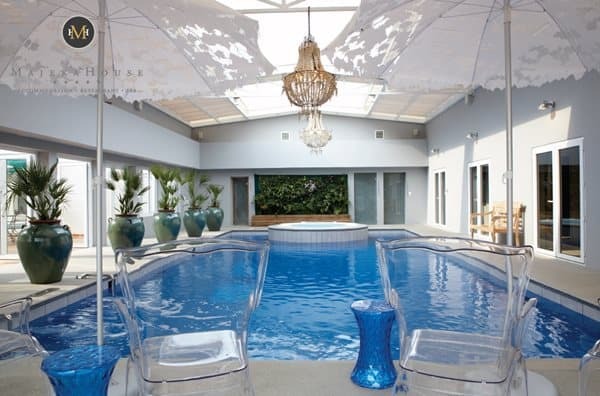 The Majeka House is situated in a quiet residential area, about a ten-minute drive outside Stellenbosch town. The rooms are huge and the amenities are top notch (including the best bath-robe I’ve EVER worn!). There’s a fabulous restaurant and spa to boot! Read about my stay at Majeka House. The Delaire Graff Lodges have arguably the most spectacular views in Stellenbosch! The accommodations are spacious and have decks with incredible views. There’s also a terrific spa and two excellent restaurants. Read more about South Africa on Velvet Escape. We would like to get hotel packages in Stellenbosch for 60 passengers. Great Article! Stellenbosch is just stunning.Beautiful Pictures. You are indeed fortunate! Stellenbosch is just gorgeous! Hi Keith. Stellenbosch is my favourite place and I’m so fortunate that I can zip there in 20 minutes from somerset west to go and get my favourite Coffee at Deluxe and just go walk through stellenbosch for the vibe. It’s summer, nearly autumn, in South Africa in February. The Western Cape (around Cape Town) has warm summers and cool winters. Summers can be around 30 degrees Celsius. Autumn (March-May) is lovely, with daytime temperatures a bit above 20 degrees and cooler evenings. Hope this helps. It’s quite a place to visit. Spa, wine, chocolate and nice weather. How cold / hot it is this time of the year ? Glad you enjoyed the post Alex. 🙂 Hope you get to visit Stellenbosch on your next visit to Cape Town. Wow! Stellenbosch is simply amazing.I have been to cape town twice but I had clue that about this part.The wine looks so fresh.Beautiful pictures.Thanks for sharing.